The D-LPTA is the ideal solution to add a laptop arm & tray to any 35 mm. diameter pole. 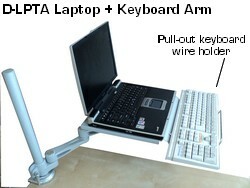 This item is the same pole-clamp and laptop-keyboard tray-arm used in our DLAC2 Laptop Desk or Wall Arm , but without the desk pole-stand. It consists of the pole-clamp plus the arm plus the laptop tray (not the pole), for applications where the installer already has a 35 mm. diam. pole. 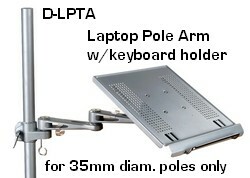 The D-LPTA laptop platform arm is also used to add a laptop tray to our DVC03 LCD Pole workstation or to any of our LCD mounts based on 35 mm diam. poles. If you need to add a laptop arm & tray to a table or desk, and do not have the pole and desk clamp, you will need this item instead: DLAC2 Laptop Desk or Wall Arm . The first image above shows the pull-out wire-keyboard holder. 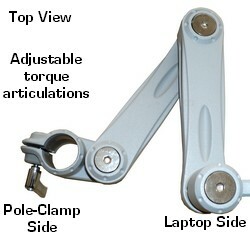 The second picture shows the three torque-adjustable articulations, which allow it to act as an elbow arm that can be pushed next to the pole or be fully extended up to 22.5". The laptop platform can also swing 360 around the pole. The tray itself also rotates, so virtually any position can be achieved. As shown in the top image, the tilt can be adjusted from zero (horizontal) to fourty-five degrees. A lip prevents the laptop from slipping off, aided by anti-slip pads. The height can also be adjusted along the pole where it will be mounted, by slighlty releasing the pole-clamp lever (no tools needed). The platform has a ventilated surface. This item is totally made of steel, used for commercial, industrial, overall business, and even home-office applications. The surface is powder coated with lead-free silver paint. - Distance from edge of pole to front edge of tray: 22.5" (max. extension). IMPORTANT: as mentioned above, this item does not include the pole, which is only shown to help understand the product's application. This clamp can only be used on 35 mm. external diameter poles (approx/ 1 3/8").